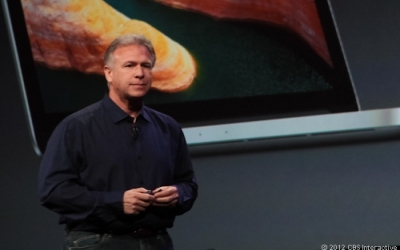 Phil Schiller, head of marketing for Apple, talks up the iPad. SAN JOSE, Calif. - Samsungs devices that looked like the iPhone made it "much harder" for Apple to differentiate and sell its devices, Apples head of marketing, Phil Schiller, on Friday told a court here. Schiller, speaking in a retrial for damages owed by Samsung for infringing Apple patents, said Apples marketing would have had even more success if Samsung hadnt released similar products. "This was an incredibly important time," he said. "As this [infringement] has been occurring, its harder for us to get new customers and bring them into our ecosystem." He added that Apples marketing strategy revolves around "the product as the hero," highlighting features and capabilities that differentiate its devices from all others on the market. But Samsungs devices caused consumers to "question our design skills in a way they never used to," Schiller said. Schiller added later during his testimony that copying one feature is as damaging to Apple as copying 50. He noted that creating designs and features that differentiate the company is Apples entire business. "At the end of the day, theres a cumulative effect of doing all of this thats incredibly damaging," Schiller said. Samsung gained huge market share in smartphones because it copied Apple, Schiller added. Thats also why Samsung flourished while other Android makers such as Motorola floundered, he said. "There is a difference," Schiller said. "One is copying. The others are not - as much." The comments come on the fourth day of a retrial for damages that Samsung owes Apple for infringing on five of its patents. A judge in March vacated about $450 million of an original award. Samsung is still on the hook for $600 million, no matter what happens in the retrial. Schiller first took the stand in the retrial against Samsung on Thursday with only 11 minutes left in the session. That gave him just enough time to introduce himself and talk briefly about his role at Apple, the development of the iPhone, and the event introducing the device. He told a court that the iPhone was a "bet-the-company product," and that now the entire company works on it in some way. Schiller spent most of his time on the stand Friday dodging questions from Samsung attorney William Price. He couldnt remember whether Apple did surveys on the strength of its brand, he said he wasnt aware of some of the early pioneers in multitouch technology, and he demurred on questions about patent specifics. Samsung, meanwhile, tried to show that even Apple responds to rivals - such as with the iPad Mini - and that its not illegal to replicate designs as long as theyre not infringing on patents. Schiller, however, argued that the iPad Mini, Apples 7.9-inch tablet, wasnt designed in response to competition such as Samsungs smaller tablets. "We were not trying to respond to competition," Schiller said. "We were simply trying to make our product better." Outside U.S District Court in San Jose, Calif., the scene of the Apple v. Samsung trial. (Credit: Josh Lowensohn/CNET) He also echoed comments from the trial last year, saying he was shocked when he saw Samsungs Galaxy phones. "It looked exactly like the iPhone, so much so people might confuse it," Schiller said. Schiller wrapped up his testimony at about 11:25 a.m. PT Friday. Apple said it may call him back to the stand later, if needed. Court kicked off Tuesday with jury selection in the United States District Court for the Northern District of California. The trial is slated to last about six days before the case is turned over to the jury - composed of six women and two men - for deliberation. Judge Lucy Koh on Friday said witnesses likely will wrap up testimony Monday. The two sides likely will present their closing arguments Tuesday. Earlier this week - Wednesday - involved opening arguments where Apple asked for $380 million in damages, and Samsung said it only needs to pay $52 million. Apple witnesses who have taken the stand in the case since Wednesday include a couple of experts on touch-screen technology, an Apple executive in charge of components and materials procurement, and a few Samsung executives via deposition videos. Scroll Left Scroll Right The bulk of the session Thursday included questioning of Julie Davis, an expert accountant hired by Apple to determine just how much Samsung owes the company for infringing on its patents. She testified that Apple lost sales due to Samsungs infringing devices. But even if the jury decides Apple didnt lose a single sale because of Samsung infringement, damages should be $287 million, Davis said. Much of the difference between Samsungs and Apples damages calculations comes from how much Apple should receive for royalties and what profit Samsung generated from the infringing devices. Both companies agree on the number of devices sold as well as the revenue Samsung generated. However, Samsung said it made a lower profit than Apple believes because of costs such as marketing. Apple originally filed suit against Samsung in April 2011, accusing the Korean company of copying the look and feel of its products. Samsung countersued two months later over patent infringement and said it was at work on touch-screen phones with giant rectangular screens and rounded corners well before Apple showed up. The initial trial, which stretched more than three weeks in August 2012, wrapped both of those cases in one, somehow squeezing together the patent infringement issues, alongside antitrust claims, and even trade dress issues. During the initial trial, Schiller, who is a frequent face at the companys product launches, retold the creation story of the iPhone and the iPad. He also gave the world a glimpse of a secret portion of Apples marketing strategy - how much it spends on the ads that are plastered across billboards, magazines, and TV screens. From fiscal 2008 to 2011, Apple spent $647 million marketing the iPhone and $457.2 million marketing the iPad. In August of last year, a nine-person jury sided with Apple on a majority of its patent infringement claims against Samsung. At that time, the jury awarded Apple $1.05 billion in damages, much less than the $2.75 billion sought by the Cupertino, Calif., electronics giant. Samsung, which asked for $421 million in its countersuit, didnt get anything. However, Koh in March ordered a new trial to recalculate some of the damages in the case, striking $450.5 million off the original judgment against Samsung. What that means is Samsung is still on the hook for about $600 million in damages, but a new jury has to decide how much else it owes. The products in question include the Galaxy Prevail, Gem, Indulge, Infuse 4G, Galaxy SII AT&T, Captivate, Continuum, Droid Charge, Epic 4G, Exhibit 4G, Galaxy Tab, Nexus S 4G, Replenish, and Transform. The Prevail in particular racked up $57.9 million of the damages tally, which Koh said was a failure on the jurys part, since the device was found to infringe only on utility patents, and not on design patents. Scroll Left Scroll Right Updated at 11:55 a.m. PT with additional comments from Schiller.